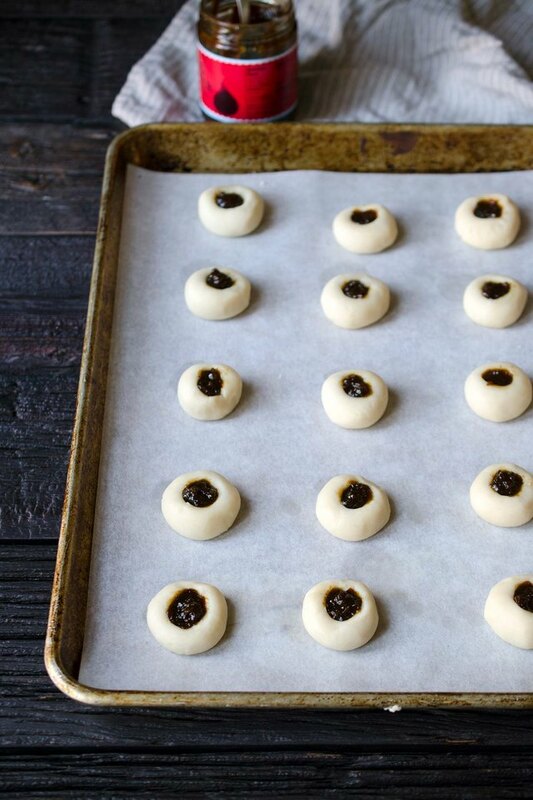 Thumbprint cookies are one of those lovely treats that you'll find on countless dessert trays throughout the year (though they're most often associated with the holiday season). They're colorful, sweet, and pretty to look at. They're also a fun dessert to prepare with kids! This recipe uses a shortbread base, making it an egg-free recipe that comes together in no time. The best thing about thumbprint cookies is that you can use any type of preserves, jelly or fruit butter as the filling. Use what you have! Go with your favorite. If you want a more colorful display, try using a variety of different fillings. In a stand mixer fitted with the paddle attachment, cream the butter, sugar and salt together on medium-high speed until light and fluffy, approximately 5 minutes. Add the vanilla and mix for another 15 to 20 seconds, then scrape down the sides. Add the flour in two batches, pulsing the mixer on and off to begin incorporating the flour. Then turn the mixer to low speed, and mix until the dough comes together. 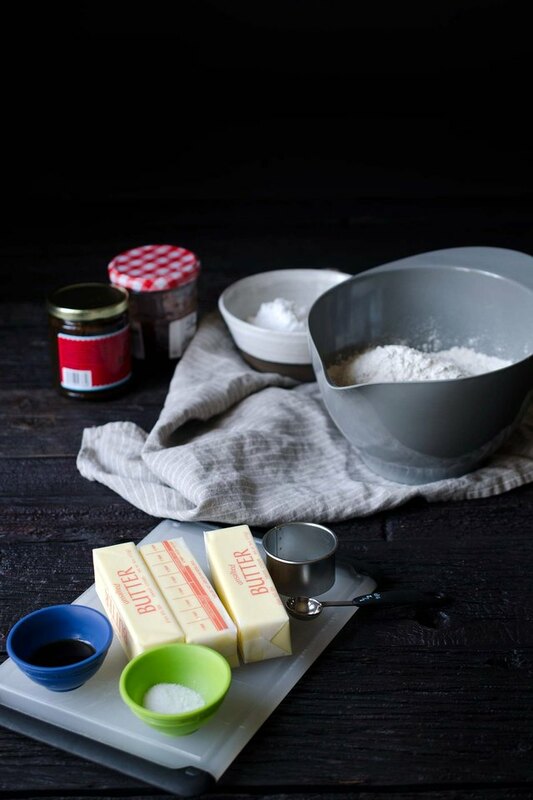 Place the bowl of the stand mixer in the refrigerator and chill the dough until the butter firms up, 30 to 40 minutes. Line 1 large or 2 standard baking sheets with parchment paper. 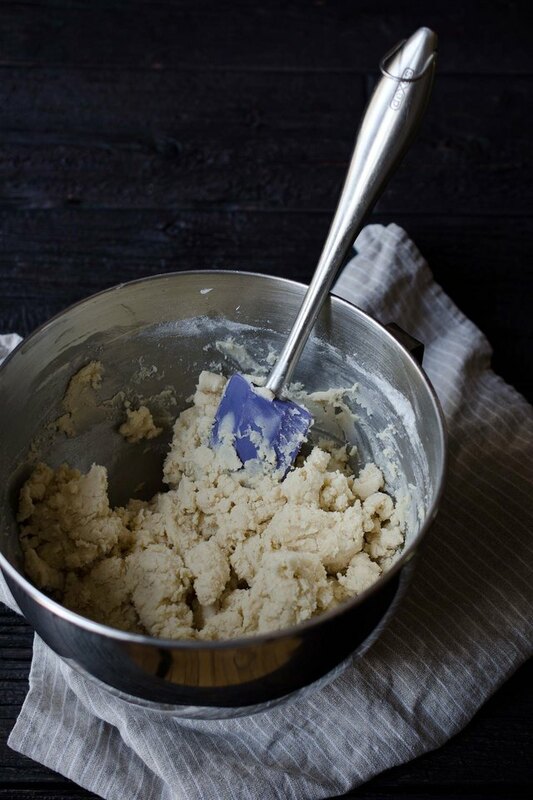 Use the cookie scoop to portion out the dough and roll it into balls (note: this recipe should yield approximately 24 to 30 cookies). 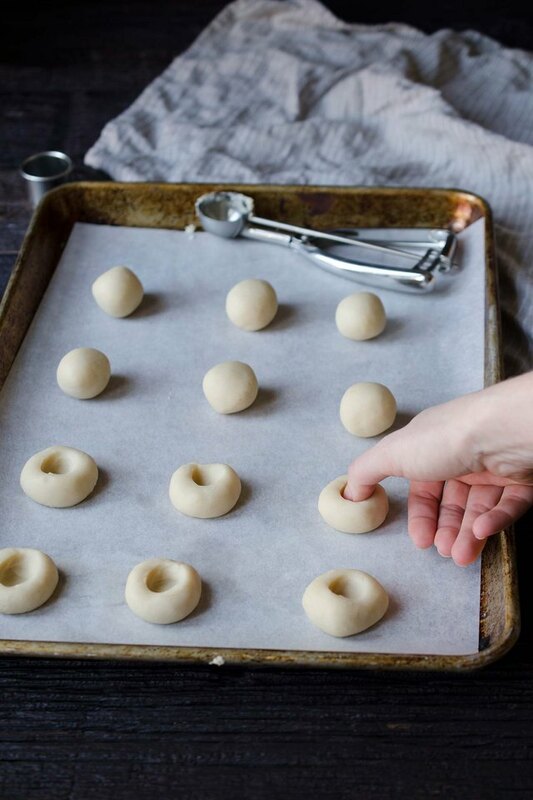 Gently create an indentation in each cookie using your thumb. Alternately, you can also use a 1/2 teaspoon measuring spoon to press gently into the dough. Spoon your filling of choice into the center of each cookie. Refrigerate the trays for 10 to 15 minutes to give the butter a chance to firm back up slightly. Preheat the oven to 350 degrees Fahrenheit. If using a large baking sheet, place an oven rack in the center. Bake for 20 to 25 minutes, until the cookies are just barely turning golden brown near the bottom. If using two baking sheets, divide the oven into thirds, spacing the racks evenly from the top and bottom. After 10 minutes of baking, rotate the two cookie sheets to ensure even cooking. Bake for 20 to 25 minutes total.